If you are interested in 3D printing you must have heard of e-nable by now. It's like that kid in the classroom that everyone likes. And that kid is about to get a new best friend. We can leave it up to the ‘Technische Universiteit Delft’ (TU Delft) to amaze us with this fantastic project. 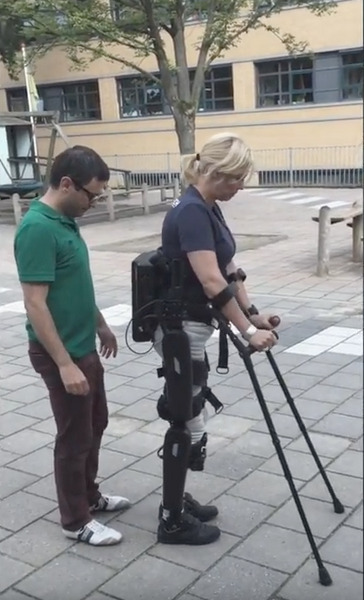 ‘Project March’ is the name it goes by, and the team behind it is developing a sporty exoskeleton to take part in competitions and contribute to the development of this technology. One of their goals is to finish the Cybathlon 2017 track under 10 minutes, which is a real challenge. Project March also uses Ultimaker 3D printers to prototype parts of their exoskeleton. They have agreed to visit this Ultimaker Session and will bring a couple of prototype parts of their exoskeleton that they have 3D printed and tell us more about their developments. If you want to know more about how an exoskeleton works, where that technology is headed or want to learn more about prototyping with a 3D printer in general? Make sure to stop by! Unfortunately I just heard 'Project March' won't be able to bring the entire exoskeleton. They have promised to bring some very interesting examples of what they made with them, so I am excited to see what it will be! We are looking forward seeing you on Protospace's new location! This location has no carpark of its own, but there are two (paid) parking spaces nearby you can use: parking garage Cambridgelaan and parking lot Padualaan. We parked at the Padualaan last time, which was only a 4 minutes walk from Protospace. The entrance to the parking lot is easily missed though. I have marked it with the blue dot at the Leuvenlaan. We would appreciate it if you could RSVP following this link. Thank you! !